The 2016 Memorial Cup gets underway today, and is available for all interested fans to take in on Sportsnet. This four-team junior hockey tournament is a great way for fans to get that last bit of scouting done before the draft next month. These teams, three of which are champions of their respective leagues (the final is a host team), are often powerhouses led by older players. Even so, there are usually some enticing draft eligible youngsters getting involved, and this year is no exception – even if most of the top end draft eligible talent plays for the same team. Let’s check out which players are available on each of the four Memorial Cup teams. We’ll start with the big fish. 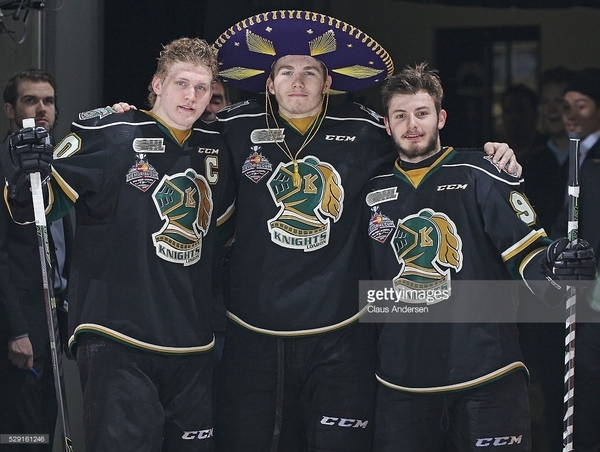 The Knights not only have some of the OHL’s best players on their roster, including Toronto prospect Mitch Marner and Arizona prospect Christian Dvorak, but they are also the aforementioned team that is carrying the majority of draft eligible talent heading into June. On top of being the only team in the Memorial Cup with multiple potential 2016 first rounders on their roster, they have a pair of players who are locks to go in the top ten: Matthew Tkachuk and Olli Juolevi. It doesn’t stop there though, as they’ve got another likely first rounder in Max Jones, and a few more players who are slated to go in the third, fourth, or fifth rounds. The main draft eligible draw in this tournament is a potential top five pick, power winger Matthew Tkachuk. Tkachuk’s offensive vision and creativity have been lauded throughout his draft year, as has his habit of consistently being one of the best players on the ice, no matter the scale of the game. Matthew is the son of former hulking NHL forward Keith Tkachuk, and although he has nights where he seems to be a reincarnation of his father, their skill sets are not always aligned. Matthew doesn’t have the shot that his father was known for, and isn’t nearly as mean – of course, Keith wasn’t “Keith Tkachuk mean” when he was 18 either, so there’s room to grow into that. There was a lot of talk earlier in the year about how much of Tkachuk’s success was attributable to his London linemates: Mitch Marner, a truly elite player and fourth overall pick in 2015; and Christian Dvorak, a 2014 Arizona second rounder who led the OHL in scoring in 2014-15 and was second in scoring in 2015-16. Tkachuk’s primary points percentage was considerably lower than one might hope of an elite talent, though it’s hardly his fault that his linemates were elite talents. Over the course of the year, one would expect a lesser talent who is just along for the ride to be exposed – that hasn’t happened with Tkachuk, and through the OHL playoffs, he made the case that he is a contributor on that line, and not just a passenger. pGPS only acknowledged one match for Tkachuk’s 2016 season – former Canuck Andrew Cassels’ draft+1 year. Cassels scored 151 in 1987-88, and really only becomes a match when era adjustment brings their production rate a little closer. I use a standard similarity score to determine matches, and I’ll stick to that, but if I were to relax it just a little, here’s a list of players who just barely missed the cut, in order of statistical similarity: John Tavares, Corey Perry, Jason Spezza, Jason Allison, and Jeff O’Neill. All those matches (with the exception of Tavares) are for those players’ d+1 seasons, the reason largely being that Tkachuk is among the older first time draft eligible prospects. The bottom line is that Tkachuk’s draft year aligns closely in terms of era adjusted points per game with some pretty outstanding players in the year after they were drafted. Finnish blueliner Olli Juolevi has spent much of the 2015-16 season fighting for the mantle of top defenceman in the 2016 draft. It’s unclear whether he has succeeded yet – any of Juolevi, Jacob Chychrun or Mikhail Sergachev could be the first rearguard taken in June. Of the three, Juolevi is seen as the best playmaker, with high level vision and passing ability. As such, it has been suggested that he might be the most likely of the trio to earn a Norris trophy at some point in his career, what with the award being consistently given to defencemen who pile up points. This was Juolevi’s first season in North America, and he seems to have adjusted well enough – though there’s little doubt that it was his performance in international competition that really brought his name to the forefront. Juolevi was a little quiet down the stretch of the regular season and into the playoffs, but he’s at the top of his game now. pGPS took a real shine to Juolevi, finding that 78.95 per cent of matches became NHL regulars. There are some impressive names in that set including P.K. Subban, Drew Doughty, and Alex Pietrangelo. His closest comparable was former Canuck Jeff Brown, at just under 98 per cent similarity. Max Jones is a legitimate first line OHL talent that has been bumped down a spot in London’s pecking order on the left side at both even strength and the man advantage thanks to Matthew Tkachuk. As such, it’s likely that his point totals are a little lower than they could have potentially been if circumstances were a little different. Jones is a power forward with a noticeable on-ice presence, an impressive work ethic and a heavy shot. Among his weaknesses appear to his decision making a discipline, as he tends to “cough up the puck at times, and he takes a lot of bad penalties”, according to ESPN’s Corey Pronman (paywall warning). The numbers seem to back up that assertion – with 106 penalty minutes in 63, Jones had the second highest PIM/GP of any player with 50 or more points (trailing only Sarnia’s Pavel Zacha. Jones was in three fights this season, as well as a match penalty for a slew foot, leaving 86 penalty minutes in minor penalties. In one game in February, he took eight minutes in minors and a double minor, all of which were stick infractions. In the playoffs it has been even worse, piling up 23 minutes in just six games (3.83 PIM/GP) – which doesn’t even account for the 12 game suspension he received for a brutal headshot on Owen Sound’s Justin Brack. Jones is a rough and tumble, on the edge player, so high penalty minutes are part of the package, but he’s going to have to work on his discipline as he advances to the next level. Max Jones’ pGPS score clocks in at 36.8 per cent, with his successful matches scoring roughly half a point per game in the NHL. Ron Francis, Gary Roberts, and Todd Bertuzzi were among his most prolific matches, while players like Shayne Corson and Adam Creighton had NHL production stats closer to the average of his match set. He’s a smooth, mobile skater that loves to drive the play from the back end,” Deschenes said. “He is a smart, offensive minded, puck-moving defenseman that contributes significantly to the Knights offense. His defensive coverage and his ability down low aren’t the greatest, but he has been making improvements over the course of his two OHL seasons. His hockey sense and vision coming up ice is noticeable practically every shift and while he makes some risky plays, they more often than not lead to something tangible for the Knights. Mete also received praise from Corey Pronman, who called him one of his favourite players and ranked him 42nd among skaters. Pronman noted that “on a team full of superstar prospects in London, [Mete] found a way to consistently stand out. He’s one of the best skaters in the draft class, and he uses his speed in conjunction with a strong hockey IQ to make up for deficiencies in other areas. pGPS found 18 matches for Mete, with four going on to become NHL regulars, for a score of 22.2 per cent. Mathieu Schneider and Brian Campbell are the strongest of that group. Another player buried on the depth chart as a result of the strength of the London Knights. He’s played in the Knights’ bottom six and on the second powerplay unit. He’s relied upon in important defensive situations and is strong in the faceoff circle. He may be the type of player that blossoms as spots open up above him, not unlike Cole Cassels did a couple of years ago once some of the older players on the Oshawa Generals graduated to the next level. The Nation Network had Pu ranked 59th on our top 60 draft eligible prospects list, and you can see Garret Hohl’s coverage of him here. 15.4 per cent of statistical matches went on to play at least 200 NHL games according to the pGPS model, scoring 0.38 points per game at that level. Some of the higher end matches include John MacLean (this one, not that one), Andrew Brunette, and Adam Henrique. Nicolas Mattinen is a bit buried on the Knights’ depth chart, but he offers some intrigue. He’s a big kid – 6-foot-4, 220 pounds – and, according to London coach Dale Hunter, he can one-time a slap shot at 100 miles per hour. Whether that number is accurate or not, there seems to be no debate that Mattinen has a bomb of a shot. Aside from his shot, Mattinen doesn’t have a whole lot of offensive upside, although he has been labeled with the “skates well for his size” tag. Rather, he sees himself as a stay at home defenceman, and that’s where he’s had the most success so far. He controls gaps well and uses his extended reach to get his stick into passing lanes and shut down plays. Despite counting a relatively modest total of 10 points in 39 games, Mattinen has an impressive pGPS score of 20.0 per cent. His match set does have a lower end NHL P/GP of 0.23, and you can see why when looking at his successful matches. Many are bigger guys with lots of games and low point totals, like Jeff Beukeboom, Bryan Allen, and Mark Methot. Increases in height draws increases in successful matches due to the NHL’s historical affinity with large players – especially defencemen. Mattinen may garner a late round look with his size partly to thank. He was ranked 136th among North American skaters by Central Scouting. Given the depth on London’s blue line, Mattinen hasn’t been seeing much action, being a frequent healthy scratch and not having played since May 7th. On top of that, he was even playing games at forward during Max Jones’ suspension. It’s entirely likely that he won’t even get into a Memorial Cup game without an injury or two to London’s back end. pGPS is not currently designed to work with goaltenders, on account on them being voodoo. That said, Parsons is a draft eligible goaltender, and he was good enough this season to work his way onto Pronman’s top ten list of goaltenders (paywall warning again), coming in at eighth. Pronman praised his battle level and “ability to make the extra effort”, but also noted his lack of grace and athleticism. Pronman rightfully muses whether Parsons’ numbers were due to his own ability, or due to playing in front of such a superior team. London allowed the seventh fewest shots against in the OHL this season, surrendering just 29.2 shots per game. The WHL champions may be a force to be reckoned with. They’re led by Florida prospect Jayce Hawryluck and New Jersey prospect John Quenneville, but their best player might be Nolan Patrick, a 17-year old who isn’t even available until the 2017 draft. They’re powerful now as well as set up for the long term. They do have a couple of notable draft eligible guys for the 2016 draft, though nothing like the high end talent that London is boasting in that category. He has developed into a catalyst on the point and a mastermind that is very capable of working the power play. His size is a concern for me as he really showed that he has a tougher time defending sizable opponents who have a physical advantage. Clague was profiled by Canucks Army’s Ryan Biech just the other day as we continue to count down our top 60 draft eligible prospects heading into the draft. Clague clocked in at #36. 27.1 per cent of Clague’s matches played 200 or more NHL games, with an averaging points per game of 0.28. Scott Hannan, Andrew Ference, and Barret Jackman are some of the top end matches. In an odd twist, both Luca Sbisa and David Schlemko meet the similarity threshold, which should send J.D. Burke into fits. Taylor Raddysh. Kale Clague. Jake Bean. Good crop of draft eligible vegetables from the CHL this year. Another draft eligible prospect that could gain some late round interest is Tanner Kaspick, who had five goals and 10 points in 21 games during Brandon’s WHL playoff run. He plays a simple north/south game and he has value as a complementary piece. He is a responsible defender and shows a good understanding of defensive coverage. He is also a player who works smart as opposed to hard. He doesn’t take shortcuts however he is over-aggressive either. He has a very understated hockey sense and shows consistency at both ends of the ice. Offensively, Kaspick does most of his work around the net front. He is a physically strong player who works his way into high scoring areas. Outside of his nose for the net, Kaspick’s O game is limited. He often has difficulty finding teammates and can get caught hesitating and holding onto the puck too long. pGPS found that 5.4 per cent of Kaspick’s matches went on to play at least 200 NHL games. Geoff Courtnall is by far the most successful player in the group, while the other successful matches include Nate Thompson, Boyd Gordon, and Lance Bouma. The set averaged 0.39 points per NHL games. If Kaspick is to chosen, it will be in the late rounds. The host team is often the weakest of the teams at the tournament, and that holds true in this case as well. The Red Deer Rebels still managed to make it to the third round of the WHL playoffs before they were unceremoniously dumped in five games by the eventual champions – the Brandon Wheat Kings. Notable members of the Rebels include Boston prospect Jake DeBrusk, Winnipeg prospect Michael Spacek, as well as Carolina’s 7th overall pick in 2014, Haydn Fleury. As far as 2016 draft eligibles go, the pickings are getting slimmer as we move along. Hagel is one of the youngest players available in all of the 2016 draft, born less than three weeks below the cut off. As such, he is likely a little bit behind his peers developmentally – he’s nearly a full year younger than some other players available. Hagel had decent production this year in Red Deer, putting up 47 points in 73 games. Those totals would make him one of the most impressive 2017 draft eligible players in the WHL if he were born just a month earlier. As it is, he was 13th in WHL points among 2016 draft eligible prospects. Of the 129 matches that pGPS found, 21 became regular NHLers (16.3 per cent). There were some interesting matches, including Shane Doan, Wendel Clark, Joffrey Lupul, and Devin Setoguchi, though each of those players were in their draft-1 season when they put up those numbers (Hagel’s late birthday led to a high volume of draft-1 seasons in his match set). Josh Mahura had a rough year, missing all but two games of the regular season thanks to knee surgery. As is typically the case, his absence caused him to tumble down the draft rankings. Pronman, who had Mahura ranked 78th among skaters, called Mahura a very useful two-way defender. While he doesn’t have plus-ability in any particular area, he is solid in several, including skating, grit, hockey IQ, and power play quarterbacking. I’m not giving Mahura an “official” pGPS score because he only played two regular season games, much too low for his points per game to be meaningful. Off the record, if I were to use the four points in 17 playoff games that he put up instead, Mahura would be awarded a score of 5.7 per cent, with successful matches ranging from Robyn Regehr to Aaron Rome. The QMJHL representative is the Rouyn-Noranda Huskies, who are led by Ottawa prospect Francis Perron and San Jose prospect Timo Meier. Of all the teams in the Memorial Cup, Rouyn-Noranda has the most woeful collection of 2016 draft eligibles. I’m really reaching here, and it’s really just for the sake of including someone on Rouyn-Noranda. If you’ve never heard of Jacob Neveu, no one would blame you. The 6-foot-2, 205 pound defender is listed at #107 on the CSS North American rankings. The Draft Analyst has him at #217 in his top 250 prospects – seven spots after the draft is over. There’s far from a guarantee that anybody from Rouyn-Noranda will be getting their name called at the draft, but I suppose Neveu is as close as it gets. He’s good on his edges to quickly pressure forwards after skating backwards and turn deceiving gaps into good stick-on-stick checks. While he doesn’t have the offensive upside to become more than a third pairing defenseman at the next level, his shutdown game and success as a composed, cerebral defenseman on an excellent team certainly bodes well for his chance to become a late round NHL pick. His skating doesn’t inhibit him in either direction and he effectively rubs out opposing attackers to come away with the puck and exit the zone. He’s a quiet, efficient defender. Only eight out of 239 matches (3.3 per cent) went on to become NHL regulars – Marco Scandella and Jason Demers are among that group. As a bonus, here are a few 2017 draft eligibles that you can watch out for this weekend. Now, there’s no guarantee that all of them will even be playing, but keep an eye out anyways. You can never start scouting too early! If you’re interested in getting a head start on the the 2017 NHL Entry Draft, then the Brandon Wheat Kings are the team you’ll want to keep your eye on. They’re currently being led in scoring by a 16-year old – the presumptive first overall pick in 2017, Nolan Patrick. Nolan Patrick missed the cutoff for the 2016 draft by just four days, similar to Auston Matthews this year. He’s still got more than another year to go before he can be called to the podium, but Patrick’s name has already been out there for years. As a 1998 birthday, he’s already played two seasons in the WHL. In the first, he was a point per game player. In 2015-16, he’s upped the ante, scoring 102 points in 72 games. The 6-foot-3, 194 pound centre projects to be an elite talent and a first line centre in the NHL in the not-too-distant future. Patrick had just three matches in the pGPS system, but all three were excellent NHLers, and two were outright stars: Mike Modano and Patrick Marleau. Mattheos will also be available at the 2017 NHL draft, and he’s a relatively late birthday for that class to boot. Mattheos was the first overall selection at the 2014 WHL draft, and he’s already 6-foot-1, 194 pounds and he hasn’t even turned 17 yet. Mattheos was 12th in WHL scoring this season among 2017 draft eligibles, with 30 points in 50 games, and seventh in points per game, but he was younger than all the players ahead of him on that list by at least a month. Mattheos has a pGPS score of 35.1 per cent, showing production similar to what Jarome Iginla and Scott Hartnell achieved in their draft-1 seasons. The successful members of the match set averaged 0.59 NHL points per game. Red Deer’s Austin Pratt is another option for the 2017 draft, and like Mattheos, he has yet to turn 17. That said, he’s already 6-foot-2, 212 pounds, and looks to be a bruising winger down the road. His production is well behind what we saw with Mattheos, having scored 12 points, including eight goals, in 56 games. Those eight goals still had him 15th in the WHL among 2017 draft eligibles, and given his size, he could be a player of interest next season. Pratt had a pGPS score of 12.1 per cent, with his production being in the same range as Murray Craven and Ryan Getzlaf in their draft-1 seasons – obviously he’ll need a large improvement points wise next season if he intends to continue down that path. The younger brother (and teammate) of Boston Bruins prospect Jérémy Lauzon, Zachary is completing his first full season in the QMJHL, which saw him score a goal and add 11 assists in 61 games. He was the third productive 2017 draft eligible defenceman in the QMJHL this season, and is settinf himself up to follow in his brother’s footsteps next season. Lauzon saw 16 of 219 matches play at least 200 NHL games, giving him a pGPS score of 7.3 per cent. Among the successful matches Sylvain Côté, Marc-Édouard Vlasic, and Jason Demers. We’re looking way down the road now. Evan Bouchard (London, #2), born in October of 1999, is finishing up his rookie season in the OHL and won’t be available to NHL teams until the 2018 draft, where he’ll likely go in the first round. The 17th overall pick by the London Knights in the 2015 OHL Priority Selection, Bouchard was the youngest defencemen in the OHL this year to play more than six games – he played 43, scoring twice and adding seven assists. Bouchard was given a pGPS score of 45.5 per cent, with matches that include Drew Doughty and Zach Bogosian. Of the 11 matches, three were players in their draft-2 seasons, like Bouchard. All three of them have played at least 450 NHL games. I’m glad Tkachuk’s season is being compared to other players’ 18 year old seasons. I was wondering about that, since the CHL defines seasons differently than the NHL, and that extra year of hockey seems to matter a lot. Seems easier to age adjust the points within a player’s 18 year old season than age adjusting within the draft year, to players who were mostly in their 17 year old seasons. With the Canucks 1st overall pick in the 2017 entry draft… Nolan Patrick. Nolan Patrick at next draft will be huge steal. Another franchise centre. Say this Marner kid looks pretty good. Is he eligible for this year’s draft or did some smart team already draft this youngster??? Watched London play live on Friday night. Juolevi looks really good, exceptional skater. Needs to grow, but another year of Jr plus a year in Utica would do him wonders. I was not impressed with Tkachuk for the Canucks. He will be a good support player but not a guy who can stir the drink. If you’re picking 5th with many needs, you need a someone who can be ‘special’ and Tkachuk isn’t that guy. Juolevi could be. I haven’t seen enough of Dumont to comment, but Logan Brown could develop into that guy with a couple more years of ‘thickening’.